Let their imaginations run wild! A friendly and FUN introduction to dribbling, stopping and controlling the ball. The First KIX program is targeted to children ages 3-5 years old and our coach to child ratio is 1:6. Our First KIX classes are unique and not like any other sports program. They are purposely designed to be FUN, silly, age appropriate and a high energy experience for children. Our soccer and programs feature exciting games and activities to teach the fundamental skills of the sport. Your child will learn to participate in a group, follow simple instructions, cooperate with peers, develop gross motor skills, and lets not forget, the obvious benefits of having them burn off some of that energy! First KIX coaches are highly experienced in dealing with this age group of children and are brilliant at what they do!! 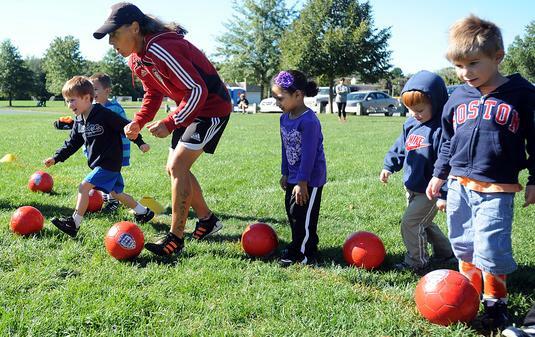 BEST Soccer First KIX program can be held at preschools and town recreation departments over a period of 6-8 weeks.